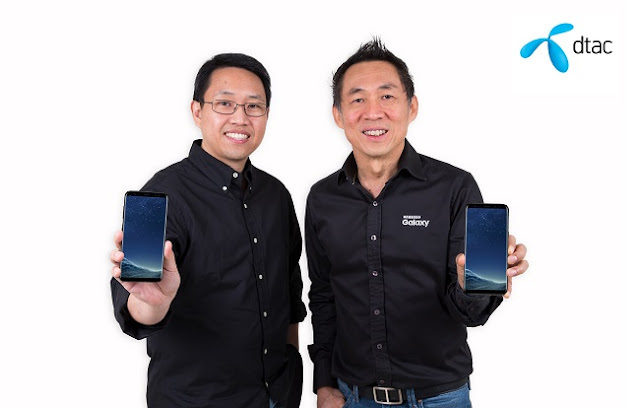 April 11, 2017 – dtac unveils Samsung’s 2017 flagship smartphones, Samsung Galaxy S8 and S8+ that feature a slick design and edgeless display with no physical home button to offer a truly immersive viewing experience. The Galaxy S8 comes with a 5.8-inch display and S8+ comes with a larger 6.2-inch display. Both models come with an iris scanning unlock feature and Bixby, an intelligent interface, or virtual assistant, that provides voice and text reorganizing and visual search capabilities. Customers can pre-order Samsung Galaxy S8 and S8+ online at www.samsung/th/galaxys8 from April 17-23, 2017 for in-store pickup or home delivery. · Exclusive at dtac, no device upfront payment and enjoy up to 24-month installment for both device and monthly package advance payment and up to 3% credit cash back. · Enjoy up to 24-month 0% installment with Citibank Ready Credit and up to 10-month 0% installment with credit cards from leading banks. Be one of the very first to own a new Samsung Galaxy S8|S8+ by pre-ordering from April 17-23, 2017 and picking up on April 28, 2017. The Galaxy S8 and S8+ will soon be available at all dtac service centers across Thailand and on dtac online store. Customers can find out more promotion details at www.dtac.co.th .